Much like a rich brandy butter complements a fine Christmas pudding so too does Dickens’ classic Christmas fable nestle cozily into an Alan Menken score. His tunes are soaring, grand and just a little bit Disney-esque and in a story that’s all about redemption and humanity that’s a perfect fit. What makes this concert performance of A Christmas Carol all the richer is the sumptuous sound of Freddie Tapner’s 32 piece London Musical Theatre Orchestra playing to support a stellar cast of musical theatre’s finest, alongside a 16 strong chorus. With just a hint of props and costuming, along with Mike Robertson’s ingenious lighting, the imagery of this show lies entirely within the audience’s imagination. 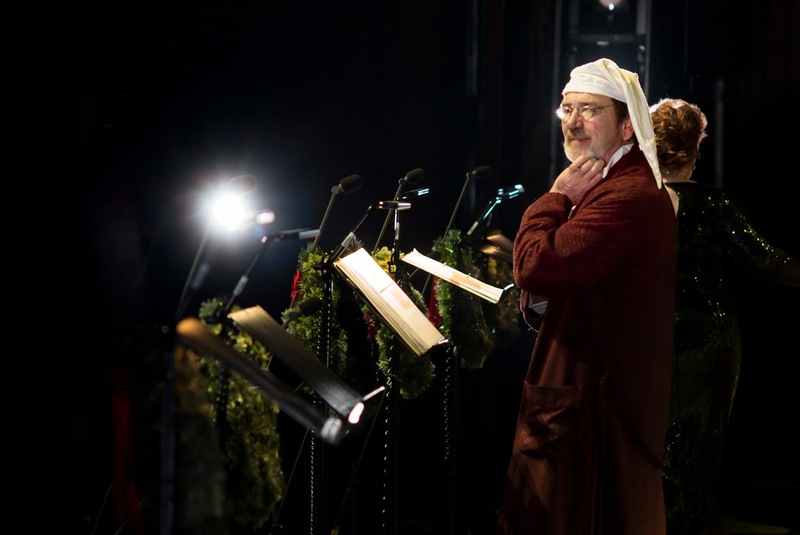 Reprising his 2016 creation, Robert Lindsay is a gnarled and grizzled Ebenezer Scrooge, blossoming as he journeys to discover compassion and kindness. Lindsay brings a weathered London nuance to Scrooge and what makes his skinflint all the more compelling is that not only is he a top notch actor with immaculate timing and presence, he is also blessed with a stunning musical talent. The company’s other Christmas cracker is Sophie-Louise Dann as Mrs Fezziwig. The show’s writers have (mercifully) trimmed the original tale and where once the Fezziwigs were focal to the narrative of not only the Ghost of Christmas Past but also the Christmas Present phantom, here they play in just the historical chapter. Dann however relishes every word, lighting up the stage with a fabulous flamboyance. In chronological order the three Christmas Ghosts, are played by Gemma Sutton, Hugh Maynard and Lucie Jones. Sutton manages what is in effect a therapy session for the old man, perfectly. As she whirls Robert Lindsay through Scrooge’s troubled childhood, bereft of love, the pair bring a sad, beautiful resonance to The Lights of Long Ago. Maynard crowned in a holly wreath brings a haunting gusto to the stage, though it is the silent veiled Jones, signalling Scrooge’s impending doom that truly chills. A doubling up in the cast however does allow Jones (as Emily) a beautiful duet with Young Ebenezer (Cameron Potts), A Place Called Home, sung when the two were married many years ago. Throughout, Tapner’s casting proves a delight. Glenn Carter brings an ugly yet compellingly youthful virility to Jacob Marley - rarely has this miserably spectre been played out so appealingly. Carter’s big solo Link By Link is Menken and Ahrens at their wickedest. Rebecca Lock and Nicholas Colicos turn in similarly top-notch cameos as Mrs Cratchit and Mr Fezziwig. And the kids are professionally cute too. Tobias Ungleston is a cracking Tiny Tim, while Aaron Gelkoff who plays a number of Dickensian juveniles through the evening brings a beautifully voiced chutzpah to the stage that is made for Menken. Nods too to young Sylvia Erskine and Ivy Pratt, both also on top form. When the show premiered in New York in 1994, it was to famously and festively return for ten subsequent sold out seasons. Lindsay makes this iteration of the timeless tale his own, and free of the wizardry of stage-crafted special effects, resting solely on the talents of its cast and orchestra, this musical concert becomes an enchantment. Returns to the Lyceum for one further performance on Monday 18th December.